It's been a few months since I've done a review, and trust me, getting around to this one was difficult. I was feeling ambitious this weekend, even updated my eBay store (click here for my shameless plug). Now on to the review. I was completely out of my favourite gel, Wetline Xtreme, and in a desperate move, I went to Boots because I didn't have time to go to one of my regular beauty supply stores. I also didn't want to wait the few days for shipping. Needless to say, I've learned my lesson. There were all of two product lines there that were marketed for natural hair. Although I don't strictly subscribe to the Curly Girl Method, I try to minimise my use of cones and mineral oil. That made most of the other products not suitable for me. Through process of elimination, I got the ORS Strand Strengthening Styling Gelee. Product Claims: ORS brings the power of nourishing Olive Oil with strengthening Indian Moringa Oil. Now you can have ultra-firm hold and must-have conditioning all in ONE gel. No crunch. No flaking. No sodium hydroxide. No alcohol. Ingredients: Aqua (Water), Polyquaternium-11, Glycerin, Carbomer, Propylene Glycol, Aminomethyl Propanol, Phenoxyethanol (and) Caprylyl Glycol (and) Ehtylhexylglycerin (and) Hexylene Glycol, PEG-12 Dimethicone, Fragrance (Parfum), Polysorbate 20, Moringa (Moringa Oleifera) Seed Oil, Olea Europaea (Olive) Fruit Oil, Benzyl Salicylate, Hydroxyisohexyl 3-Cyclohexene Carboxaldehyde(Lyral), FD&C Blue #1 (CI 42090), FD&C Yellow #5 (CI 19140). My Thoughts: I didn't fully hate it. The consistency is similar to jam, literally the raspberry jam in the kitchen, but minus the seeds. It's easy to smooth on and defines my hair. It did foam up whilst applying, but after a cold rinse and smoothing a bit more of of the Gelee on the top, the residue and foam were gone. After this, I put my hair in a puff for the rest of the week and used this to smooth my edges. 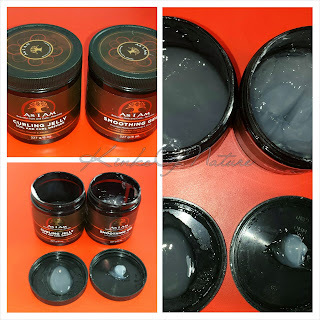 The amount of flaking and buildup was like no other gel! Yes, it smoothed my hair, but it felt and looked terrible. The fragrance is similar to other ORS products. It's a sweet floral scent. Not my favourite and it's a bit strong. Would I repurchase? No, I'm not even sure I'll finish the rest of it. I'll maybe use it to smooth my edges, but only when I know I'm going to be washing my hair the same day. The Gelee retails for £4.29 and is available in local retails and online.